It was that or my alternative headline, Y2K+9 Bug Cripples Single And Dual Railed Transit Systems Nationwide. But I thought the supernatural angle was more attention-grabbing. Anyhoo, it seems far more than simple coincidence that less than two weeks after the worst crash in the history of the DC Metro system, the less prestigious but equally important Disneyworld Monorail System (DMS) has suffered the worst crash in it's 38-year history, resulting in the death of the train's operator. 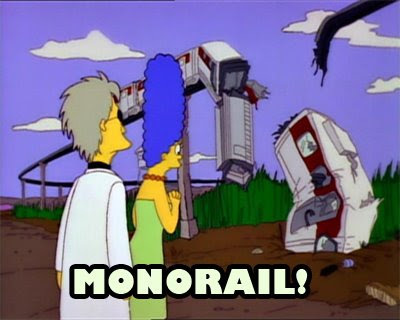 There are many similarities between the monorail accident and the WMATA accident. First, the operator or Metro's crashed train was a rookie -- she had only been operating metro trains for a few months. 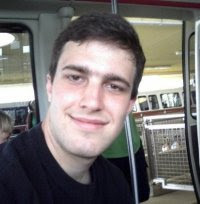 The monorail train's operator, who died in the crash, was a junior at Stetson University. He had only been a "Monorail Pilot" since October. Anyone who's been reading this blog for the last couple weeks knows I don't think that the accident in DC had to do with the operator's experience. I'm just noting the coincidence. "A former monorail pilot told Local 6 that all Disney monorails are equipped with a sophisticated 'anti-collision' system that automatically stops the trains if they get too close to each other." Metro's sytem includes thousands of relays that report the position of the trains to a central computer system. DMS's system, on the other hand, uses a sophistocated technology known as "pixellated intelligence." While too complicated to explain here, the basic premise is simple. The trains can actually see each other and are smart enough to stop before they crash. While it's unclear what may have caused Sunday's failure of the PixTel system, much like the Metro accident, scrimping on safety could have contributed to the seriousness of the problem. There has been much grumbling in recent years that outsourcing of animation at Disney has resulted in lower quality products. 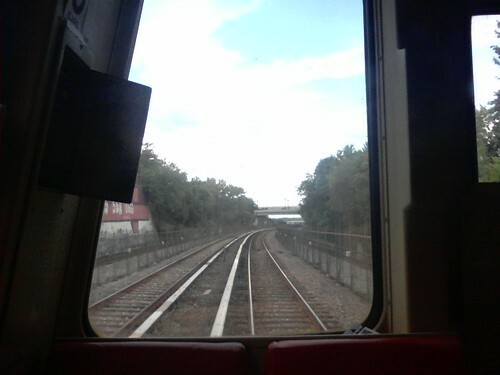 Speaking of which, I risked certain death last Wednesday and rode the Red Line metro home from Silver Spring to Fort Totten in the front car. As we hurtled through the crash site at a hair-raising 8 miles per hour, I was able to obtain exclusive pictures showing the view the operator would have had as she approached the stopped traing. This shot, based on the position of the building to my left, is about 250 feet from the bridge. You can see an aerial view from my original post on the subject. The accident occurred just around the bend on the other side of the bridge. In this picture you can actually see a train coming the other way. It's barely visible now from it's position just south of the bridge. A train on the same track would be even less visible as it would be further to the right. And so, with this final piece of photographic evidence, the book is closed. The operator had very little time to react when she saw the stopped train. While there is no reason for the catastrophic computer failure to have occurred in the first place, in the future, how about NOT stopping the trains just around the bend on a blind corner? Maybe this is a silly point. I mean, they wait in the tunnels all the time, where there is probably about zero visibility in general. But if you're going to wait right there, why not wait about 100 feet back so someone can see you stopped there... didn't they teach us this in Driver's Education? No reports yet on whether the Disney accident occurred on a blind corner. But this reporter is expecting yet another coincidence. 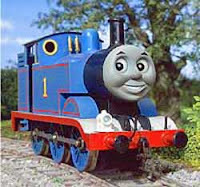 And yes, I promise I will seek help with my train crash obsession. RIP Austin Weunnenberg, Monorail Pilot.